This was my breakfast this morning. 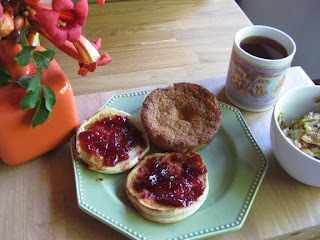 Sourdough english muffin with organic cherry jam via Trader Joe's. Apricot tea cake via Design*Sponge, summer squash gratin via 101 Cookbooks, and Tour de France tea from Moon's Coffee & Tea. Yum. In an attempt to style my not particularly attractive dish choices, I threw some trumpet vine into that orange vase. Its a difficult vase to work with because of its strong color and narrow neck. The trumpet vine is the best I've come up with-- at least with flowers picked from the yard. Its a perfect summer day outside. Soon I'll be off to a work meeting and the library, but for now I think I'll take a walk around the yard with the dogs.